Techno-archaeologist Avro Vulcan continues to catalogue the many man-made hills that dot the Ferron Proxima badlands. It has been months since he unearthed the Standard Template Construct (STC) systems for what has been classified as the Vulcan Plateau. In this time he has discovered numerous other man-made hills buried under the distinctive steep sided flat topped hills that can be found all over Ferron Proxima. 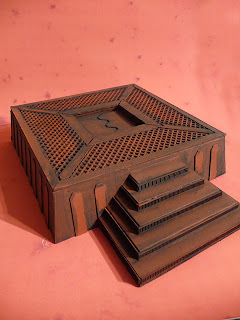 Excavating these sites has revealed one man-made hill in particular that has shown many sub-categories of construction. Vulcan has designated this hill the 'Mercury Plateau'. 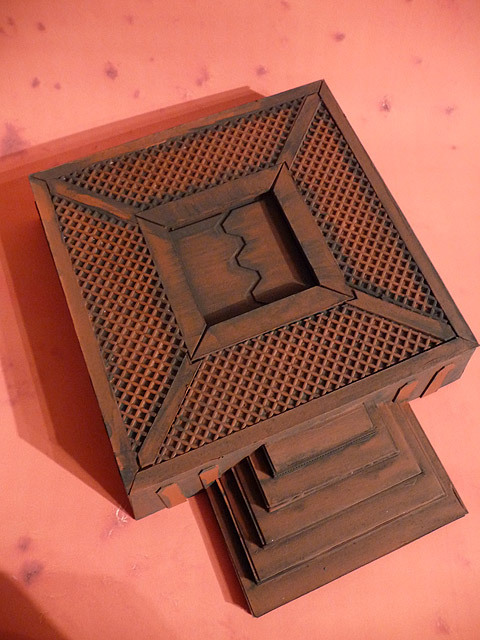 The purpose of some of these structures are still a mystery but it has been noted that some of them have a slightly different composition of rockcrete than standard Ferron Proxima fare. Whether the richer iron content is due to the value or protection of the many storage facilities built into these mounds is unknown, Vulcan has theories but so far has kept them closely guarded. What is known is that these iron-rich mounds are particularly well suited to accept the STC for Plasma Generators., was this their primary function? Indeed even the current generator model has adapted well to the Mercury Plateau and it is believed very little retro-fitting was required to the connection manifold. However, the details of this coupling was another secret kept by Vulcan that has attracted a great deal of interest from data-hackers who have sort to gain control of this valuable information to share outside Adeptus Mechanicus control. Once private enterprise can access this information they will utilise it to gain control of all Mercury Plateaus suitable for Plasma Generators, thus reducing their need to pay tithes to the Ad-Mech administration. Happy Birthday to me, this is my gift to you! Back in April I shared my idea for Belial and as the first Deathwing squad is approaching something close to completion I though I would turn my attentions to him in an attmpt to finish them simultaneously. 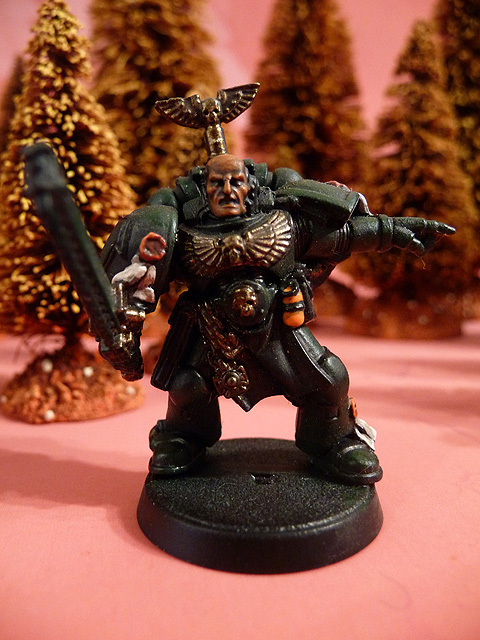 First thing first was the height difference from this ancient miniature. As he is shorter than the Assault on Black Reach terminators I decided he needed a bit more base! I got to use my Dremmel and rout a slot into a piece of slate from the garden, this has then been Vermillioned! 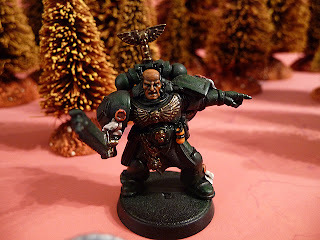 I'm going to redo the lightening claws to fit the same style as the current force weapons I'm doing, both on the Terminator Sergeant and the AoBR Captain [see the end of this post for where that's at]. Some Badab Black wash still to be applied. 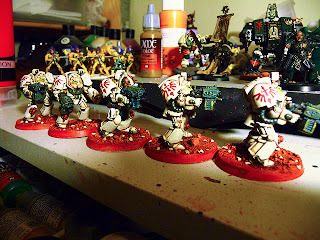 Next up was the hard part, painting over the green reinforcements. 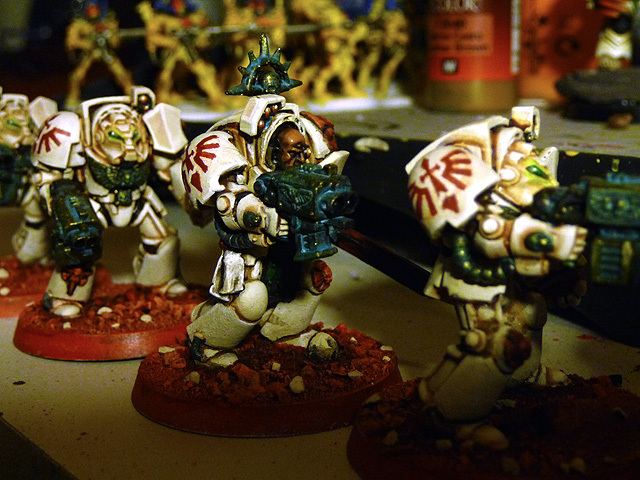 I thought they were cartoony but they did look well executed if a bit glossy and OTT. 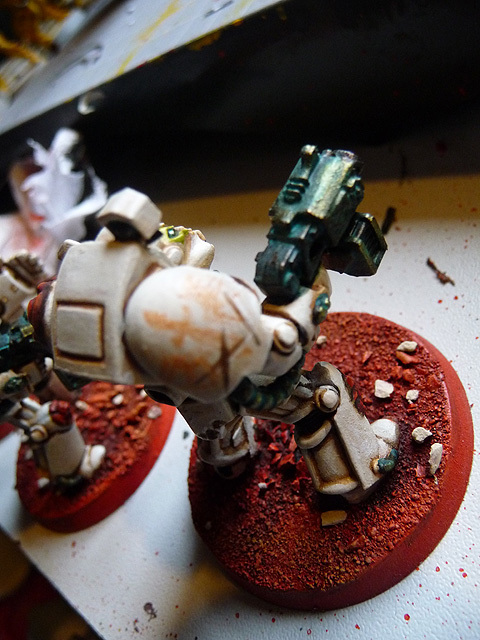 Everything that was 'green enamelled' will now be weathered bronze like the current Deathwing. 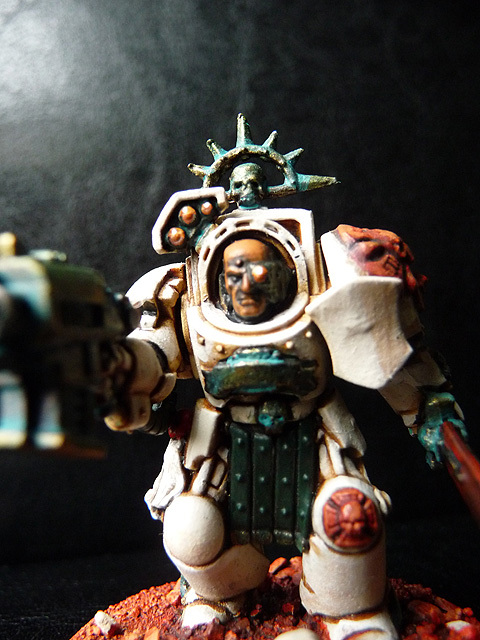 Not sure if I should change his eye lenses to green though...? 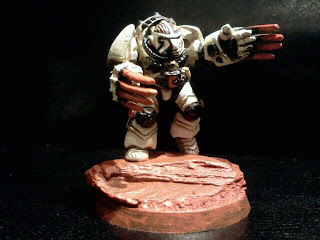 Last up his Crux has been covered in Mechrite Red and then overbrushed in Vermillion as standard. 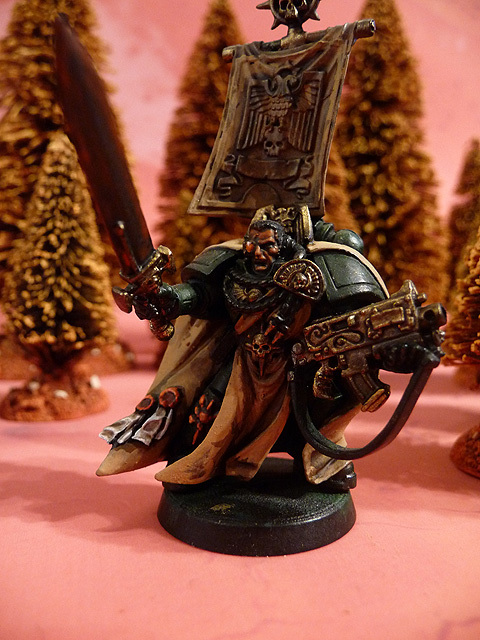 Not entirely sure how to treat the vents on the top of the armour and I need to decide if I'll drill into the middle jewel on top and pin one of the Ravenwing upgrade sprue items. It should make him look even more impressive. 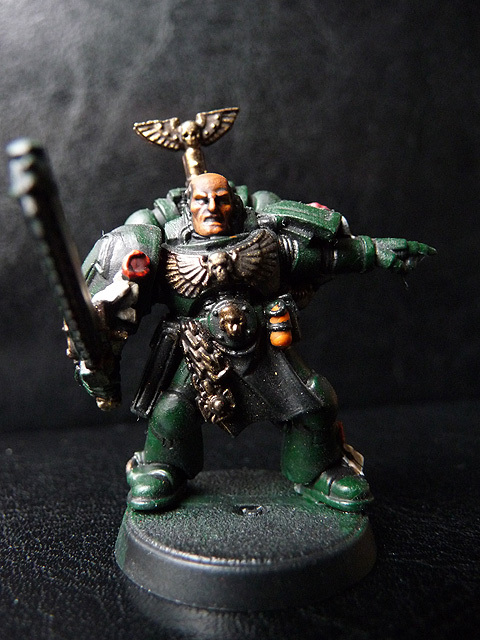 He's currently taller than the other marines but only just taller than the sergeant with his Iron Halo. Of course I'm loate to do anything that'll easily snap off, especially as this is such a 'compact' model, even if it does weigh a tonne! 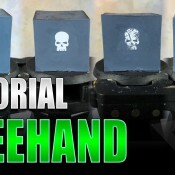 Referring back to what I said above, here's my first stab at power weapons [pun intended]. 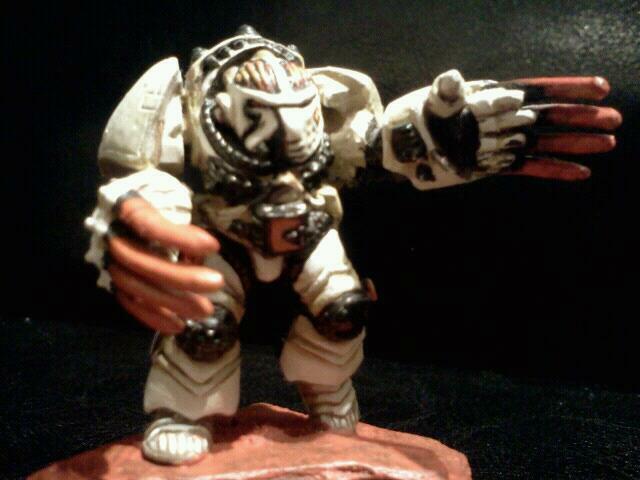 Just playing around with the Vermillion Art acrylic. 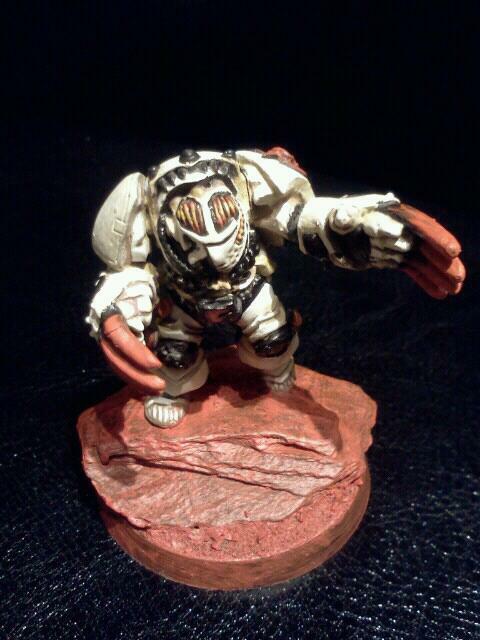 Will add some more washes and highlights. It's not awesome but I'm confident it'll be sufficient in the end. Gaming night - 1500pts Tyranids Vs White Scars pt2. Catching up where we left off or perhaps some point after that because there is something missing in the pic below and that's the Vindicator. The Trygon Prime had managed to detach itself from the power relay station and charged the tank, ripping it to pieces in it's first strike, those adrenal glands making mince meat of it's armour. 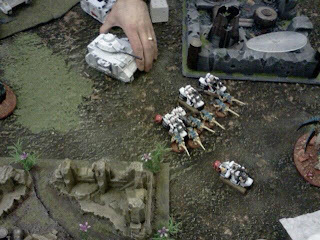 In return the bikers moved into a better firing position and the other squad put some wounds on the sky-slashers and then closed in for the kill. By the time combat was over and they had rolled [and failed] saves thanks to being fearless each base has 3 wounds down with only one remaining. 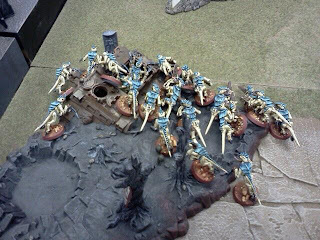 Another few turns must have taken place with the sky-slashers reduced to pulp and the bike squad consolidating back to fire at the Trygon who must have wiped out the other squad at some point through his containment spines. Additionally the Whirlwind fire targeted the Termagants holding my objective and once again the cover destroying incendiaries wiped them out except for one solitary Termagant. 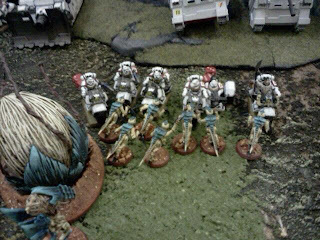 Thankfully the Tervigon kindly pooped another 9 fresh bodies to replace the 7 dead ones. The Zoanthrope was still alive at this point but he had suffered one wound already and couldn't survive the odds. He'd tried to fire a second time, passed his psychic test but his hit roll of 1 just proved how sad and pathetic the creature really is. Over on the right flank the Dev-gaunts finally made it to the party, but still no sign of the Ymgarls or the adrenal stealers. 30 Devourer shots spat forth causing a wound, which would reduce their leadership by one [not that it'd make any difference]. The Tervigon's stinger salvo was completely ineffective and I think the bike squad burned up, slaughtered the Dev-gaunts then hot-footed back out of range toward the right board edge. Little did they know that the Broodlord and his posse had been waiting patiently for such a move. 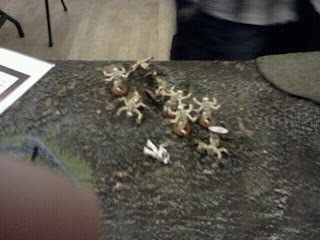 They raged onto the battlefield and tore through their bikes like papier-mâché with their rending claws. This was the scene once their grizzly work was done! Over in the middle another 12 newly pooped Termagants opened fire with their Fleshborers. I think they did some damage but their assault was pretty dire, losing half the brood in the process. The biker captain was the sole survivor from his squad by this stage but his power fist had taken teh Prime down, the Warriors effectiveness had been further reduced and so far they'd been pretty ineffective in combat. The Trygon assaulted the two remaining bikes [I think the two alongside the spore pod aren't supposed to be on the board] and promptly ate them consolidating towards the Whirlwind. 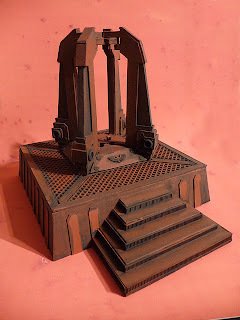 When the Broodlord turned up some psychic connection must have stirred the dormant Ymgarl stealers from their resting place in the power relay station. They boiled forth from hiding and swamped the land-speeder. The Trygon looking for it's next meal. It was during Rob's last turn that suddenly the rain of death from the Whirlwinds ceased. The scattered massively in many directions and a lot of his shots couldn't get a break. 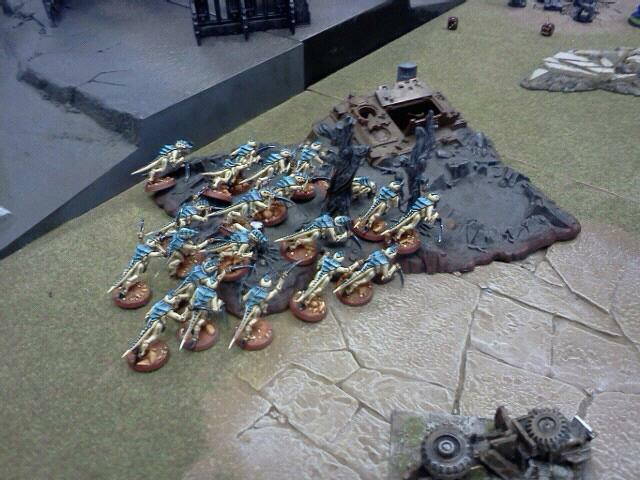 After the success so far as his bikes began to disappear en masse the remaining marines accuracy faltered. However, the biker captain destroyed the remaining Warrior and burned forwards to take on the Tervigon which by now had suffered some 3 wounds. It was at this point we had to call it a day. With that one remaining bike squad as troops he could not capture the other objective and contest mine. 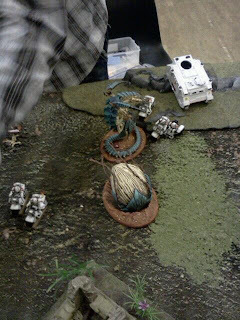 He still had tanks but they were exposed to the rampaging Trygon prime and the angry Ymgarls about to sweep across that back field. 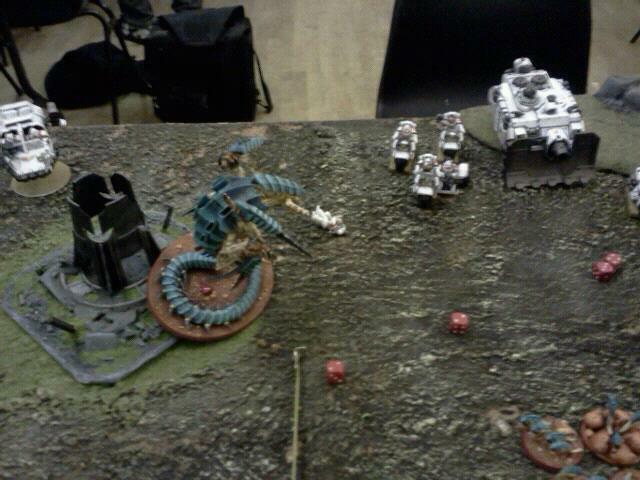 The Tervigon was eyeing the final bike squad with hunger and so I won. In conclusion: this was one of the best games I've played, proper ebb and flow, the battle hung in the balance. 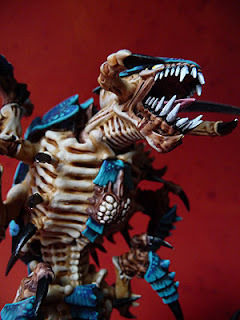 Rob is really patient with my still fledgling 5th edition gaming knowledge and every new creature that brought it's weapons, attacks or many wounds to bear was a new surprise to him as 'nids aren't played by anyone else. Bikes are really durable, that extra toughness is really hard to get past and even then the power is an awesome life saver. The twin linked bolters did a lot of damage but the Whirlwinds were supreme in thinning out the gribblies, not bad for a last minute decision. It doesn't matter if you have plenty of cover if what's aimed at you ignores it! 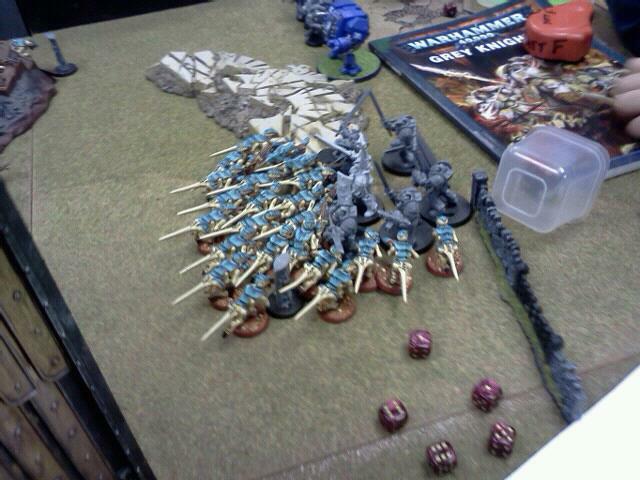 Dawn of War is a really tactical deployment. It being my first time it took quite a while to make a decision but it make a change to start the game halfway on the board even if the usually out of range Warriors screwed up their chance to shine. Genestealers were awesome, outflanking is the way to go. 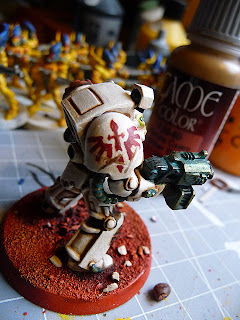 Didn't see enough of the Ymgarls to judge and I made them some special mutation markers too! 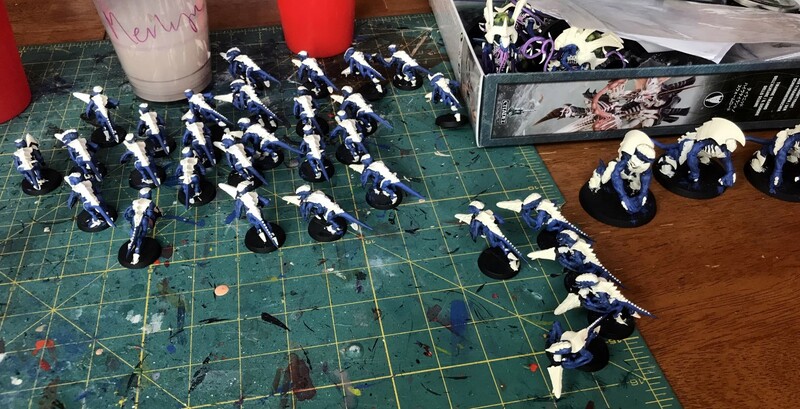 [coming soon] Sky-slashers only served to tar-pit the bikes but I think they could be fun against Eldar or guard, maybe three bases next time. 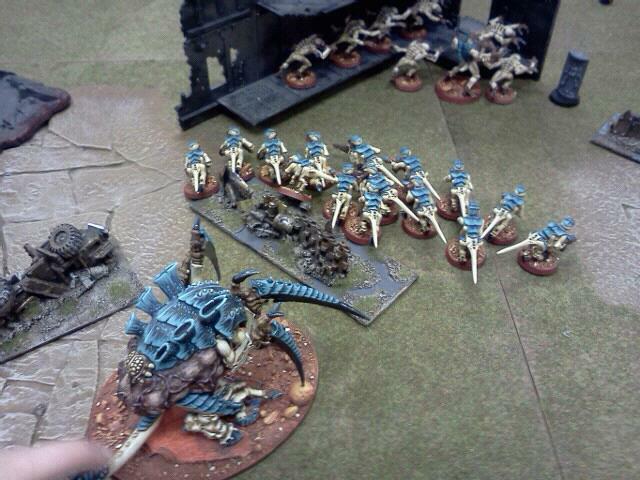 Lastly, the only good thing for a Zoanthrope is bait. Put him in the middle and have everyone shoot him for fear he'll blow them up with his 3+ save keeping him alive long enough to draw fire. 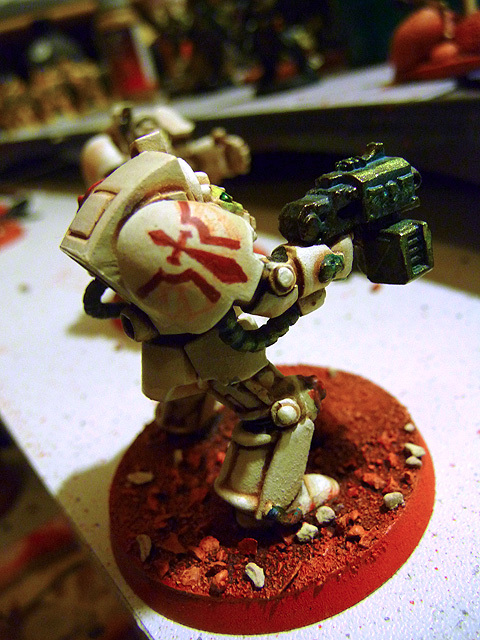 I want to try the Doom for the same reason, but the stealing extra wounds would make him even more of a target. However I don't know whether I can be bothered to spend the points on him but knowing that's I would use him perhaps little less expectation then it might surprise me when it finally does lance something! Still lots to think about for the game on 3rd March! 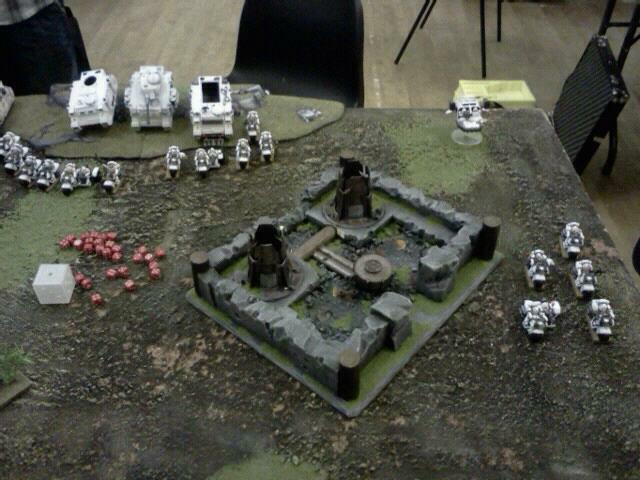 Gaming night - 1500pts Tyranids Vs White Scars pt1. I may have to do this over a couple of posts, a lot happened, but my recollection may be off so that might shorten the commentary [huzzah]. As the title suggests - 1500pts Tyranids [usual suspects for me, just with Ymgarl Genestealers and Sky Slasher Swam with Spinfists for giggles] Vs White Scars, 3 units of bikes [obviously], Vindicator, Predator, 2 Whirlwinds [he took them for a giggle] and 2 Land Speeders., Dawn of War [my first time] and capture and control. So ignore the bikes in the first pic, they're not actually there it just saved time to not take them off to put them back on. I started with the Hormies in the centre terrain piece with the Warriors and Prime for Synapse everything else would outflank/deepstrike except. 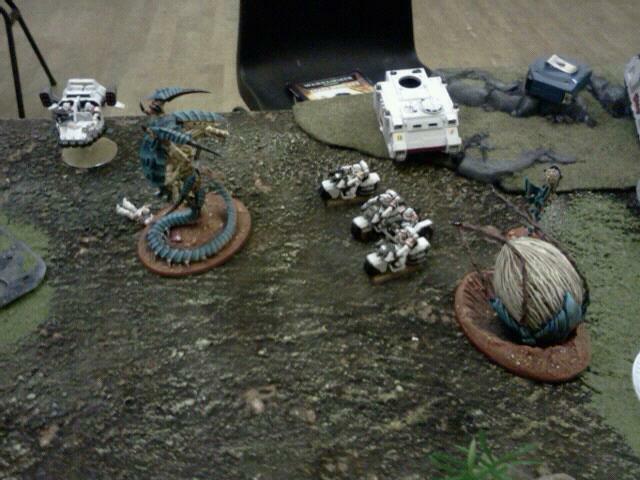 First turn the Tervigon stepped into the area terrain nearest me with the Biovore, but I forgot to spawn so objective in the centre of the terrain was not captured. 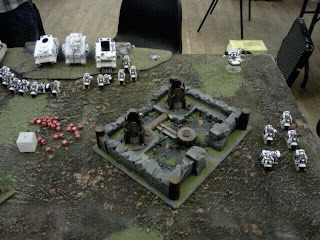 Rob, the club chairman who I was facing had his objective [a fallen White Scar rider] just to the right of that lone bike [thats not there] in the top left. 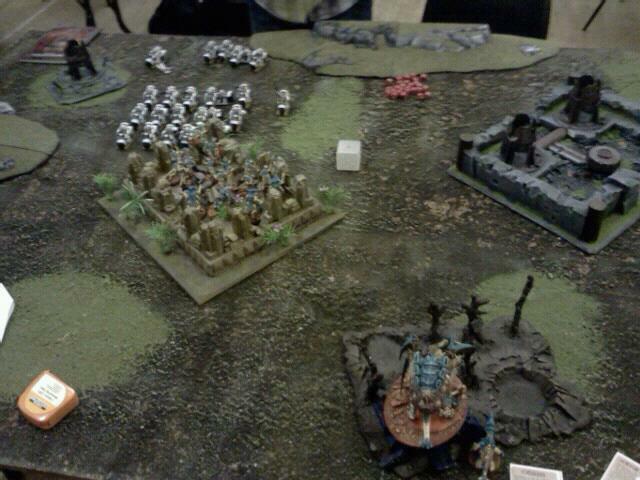 With nothing to shoot that was pretty much my turn 1. 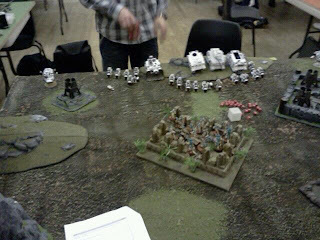 Here come the White Scars, everything burns forward but due to the Dawn of War rules stating he can't end his turn within 18" of my force that brood in the middle force him to halt his advance. Over on the right a bike squad head for my backfield objective. While over on the left not much goes on, I think for fear of that area terrain near his objective, what deep and dark secret might lurk within that strangely forbidding structure...? Rob's first turn of shooting wasn't as bad as it could be, night fighting hampered some of his units but the bikers got in range to see the Hormies and the Whirlwinds could fire whether it was day or night and they hit with abandon, wounded with no discrepancy and to cap it all ignored cover saves which meant the Hormagaunts were smashed to smithereens by the barrage of armour piercing missiles. My turn and here come the deep strikers. 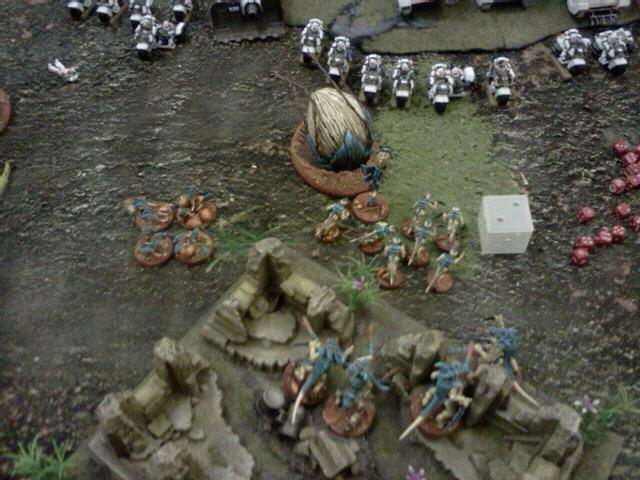 First up the spore pod slams down disgorging a Zoanthope, 4 bases of Sky Slashers deviate back from their intended landing site near the bikers. 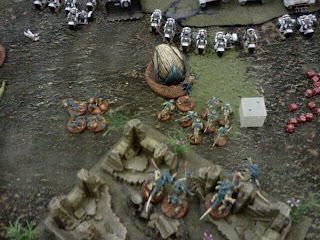 The Hormagaunts raced forwards past the pod eager to tackle the bike squad. Meanwhile the Trygon Prime bursts from the ground confused by all the biker vibrations [hence the shakey cam, apologies] not in it's intended spot but instead coming up through the power relay station and in so doing tore a hole in it's armour and suffering a wound. The Tervigon spawned 8 Termagants so we were now holding our objective. 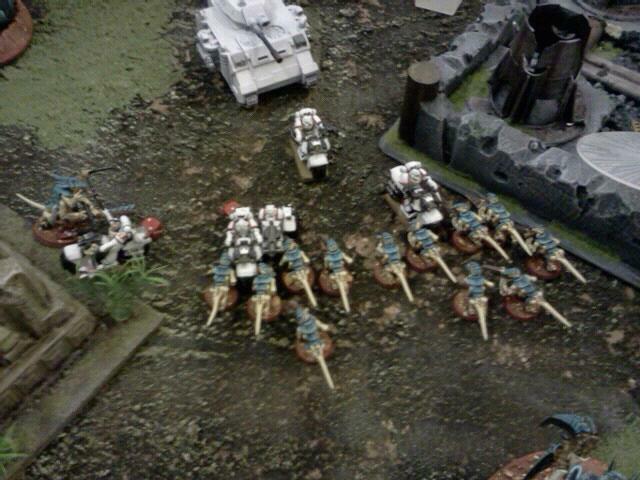 The Trygon Prime's containment Spines sparked forth taking down two bikers, the Spinefist of the Sky Slashers proved ineffective against marine armour even with 16 shots! The Tyranid Warriors whiffed all over the place as did the biovore, shots going astray and those that did hit were either not strong enough to wound the tough bikers or their Power Armour was strong enough to resist the bio-weapons. 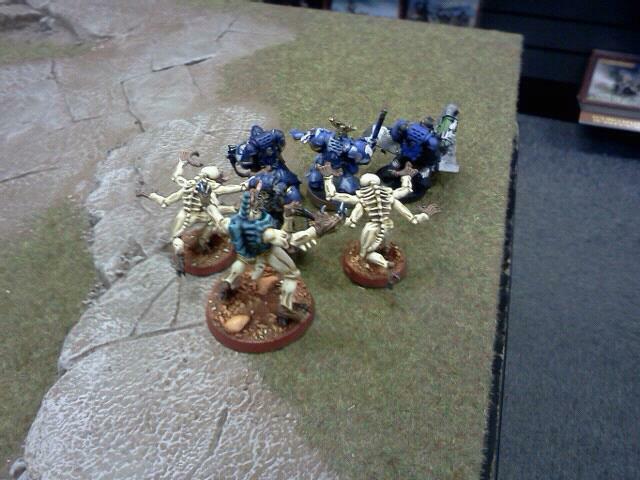 The Hormagaunts charged into the middle bikers taking one down for their 21 attacks. In return they suffered extensively and thanks to the Synapse Control telling them to keep attacking they were slaughtered for their rage fueled tenacity. The warriors were charged and used the cover wisely but not without losses. 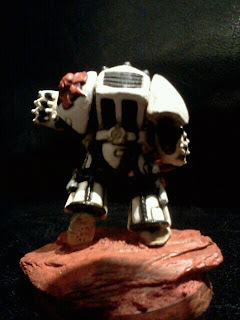 The Prime sliced and diced with his bonesword killing instantly a squad member but one of the brood fell to the Biker Captain and his fellow marines. So we'll leave it there until tomorrow. This was a mammoth game that didn't go all the way to the wire but we played pretty late so a lot did happen. 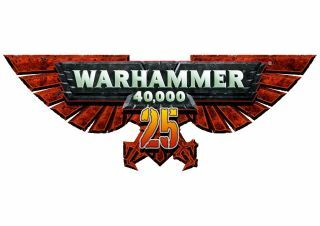 It's 40k's Birthday, I'm just a little bit older than it but if you take out the years I was 'on the wagon' I'd probably say we were even. I think I'm glad it's in my life, more so now than ever before and I'm meeting folk and sharing stuff to do which beats going out getting drunk or getting up to mischief. This may not be a 'fashionable' hobby, I think those two words are mutually exclusive but it's creative, fun, sociable and there's even a bit of maths. 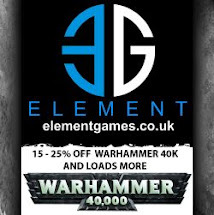 I can think of much worse things to be doing with my time so Happy Birthday 40k, here's to another 25 years of grim dark future and 'only war'. Alternatively get to use firefox which does work BUT I can only import my pics in one block and I'm unable to insert text between pics and you can imagine how that screws with what I post. If things don't resolve themselves this could have a serious impact on how I blog. I've actually got some stuff I want to post but I'm now stuggling to actually post it! I will be tryng my best though, never fear. 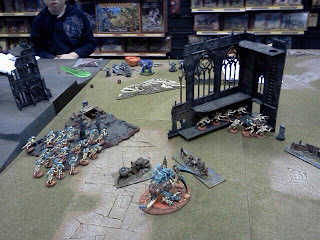 Nipped in the local GW on Saturday and had a nice chat with Stuart the manager and he advised us amongst other things* to come down the next day and have a battle. 500pts, HQ and two troops. 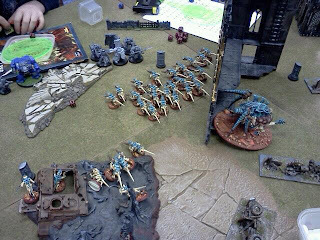 Come Sunday morning we took a Tervigon, with all the trimmings, 22 Hormogaunts and 7 adrenal stealers and their Broodlord. Setting up we had two kids turn up and they pleaded to have a three way battle with me and the nipper so Stuart set up the 'broken alliance' scenario but I could see that our 500pts against 500pts of Grey Knights and 500pts of Ultramarines would result in two against one. 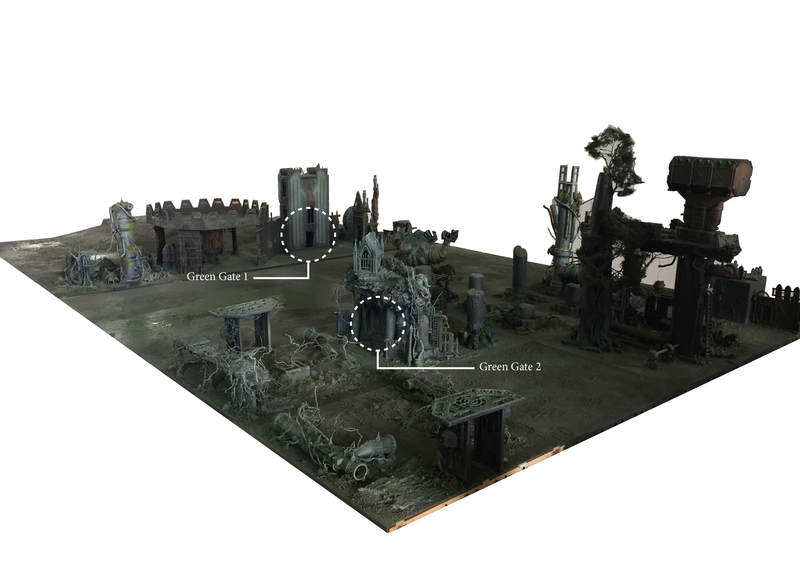 Anyway, it was objective based so it didn't really matter so long as me and the nipper could control of what was there, the 3 little door effigies [you can see one just poking out of the terrain below. We won first turn and they didn't steal the initiative. The rules of broken alliance are that in the midst of a treaty talk things break down and all out war ensues so first turn each unit rolls a dice and 1-3 they can act as normal 4-6 they're so confused they do nothing. So our Hormagaunts passed and ran 6" into the area terrain on the left in an effort to secure that objective. The Genestealers were happy hiding in the ruin, they immediately secured the second objective [the third was just the other side of the ruin in front of them. 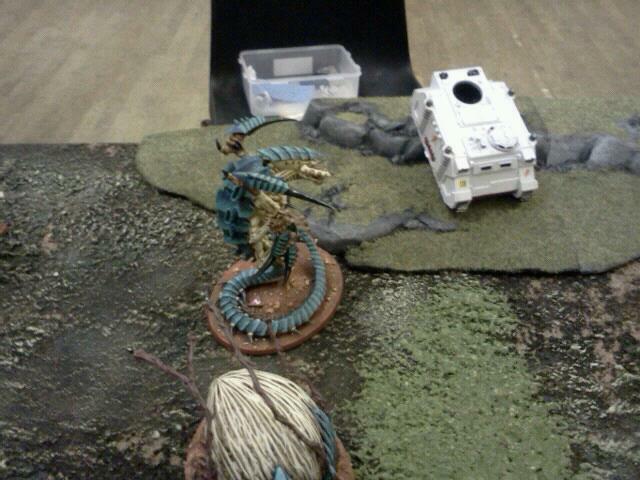 The Tervigon meanwhile was confused and sat on it's haunches wondering what it would be having for tea later on. The two kids rolled for who went second and third with third place automatically getting first turn in the following round and the remaining two dicing for who went next. 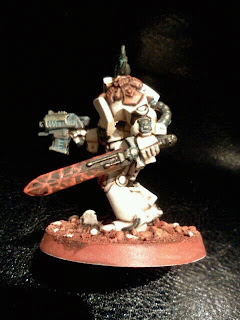 Over on the far corner the two Ultramarine tactical squads deployed in this fashion with their Librarian at the back. 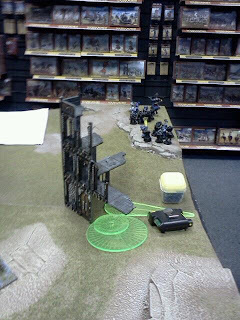 Unfortunately the two tac squads were confused and the Librarian just wandered about a bit not in in range of anyone. 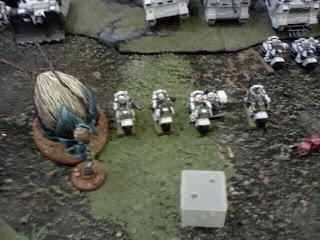 The Grey Knights stepped up and shot holes in the Hormagaunts. Massed storm bolter fire, psy-cannons a cyber eagle that never did less than 5 attacks on D6 throughout the entire game and the multi-melta and storm bolter of the dreadnought wittled them down to 17 by the time they had their last turn of round one and their first turn of round two. 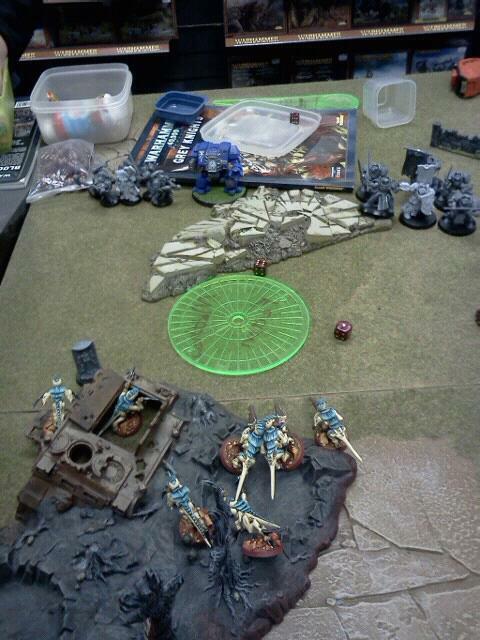 I think the front squad Ultramarines moved off the hill towards the ruin, whereas their Plasma Cannon armed brethren fired on the Grey Knights but the blast deviated wildly off target. 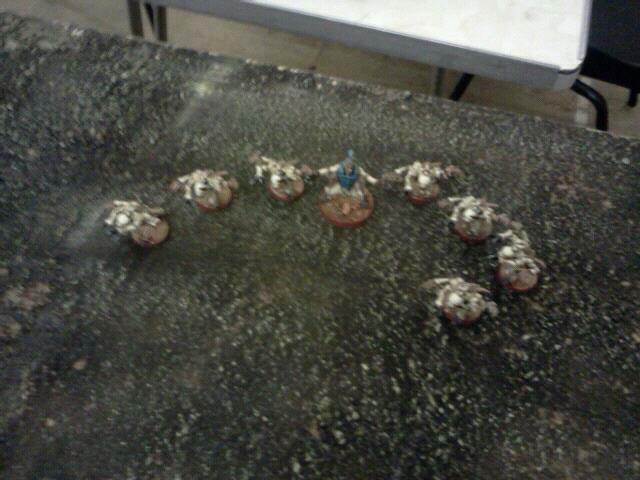 Now that the Tervigon had finished it's supper plans it remembered it had some Termagants to spawn and promptly pooped the golden 15. And this is them now, freshly gleaming and full of gunk and goo. 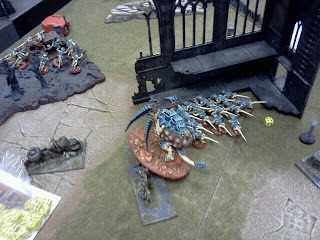 The Hormagaunts secured the objective, the Termagants moved up hiding behind the building for next turns reinforcements and the Tervigon stepped into some cover just in synapse for the Hormagaunts. Meanwhile the Genestealers rolled to see how far they'd move in cover to see if they could reach the now exposed Tactical squad 5", that'll do followed by a run and next up it was gobbling time. 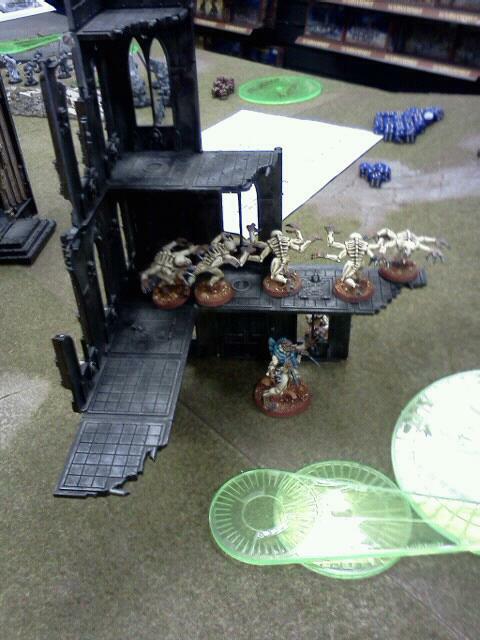 The brood ripped through the marines like they weren't there and then consolidated into the building to have some cover. Which then ended the last turn, new round and as we went last we were now first. I was pretty sure we could do the same trick, move through cover and assault the second tactical squad and wipe them out but I didn't think it'd be fair to the kid with the Ultramarines. They'd not done anything so far and to wipe out his squad in two turns would have been mean so they stayed in the building. 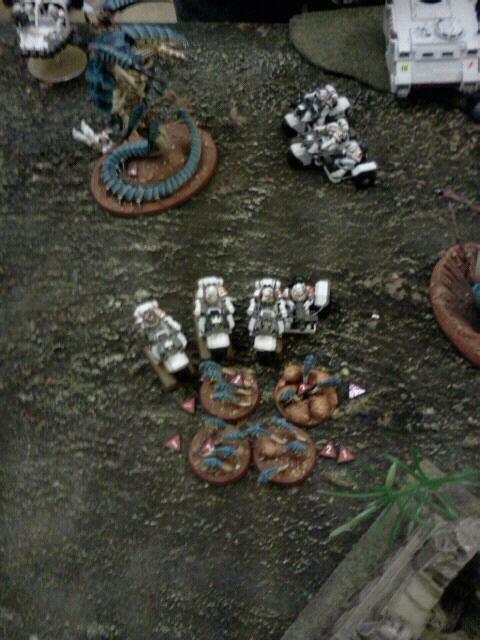 Another ten Termagants were spawned and they joined the depleted Hormies in the area terrain. 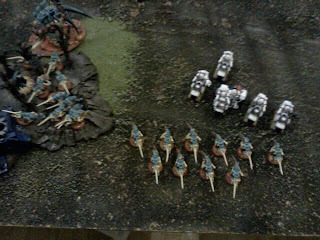 The Grey Knights all stepped into range and blasted away with massed bolter fire thinning the Hormies down even more and leaving but three Termagants in place. Meanwhile the Plasma Cannon took out a few stealers and more bolter fire took more down. In the end just the Broodlord and a a pair of adrenal stealers remained. Next turn and with the kids getting a bit antsy having to wait for two people to have a turn before getting their go it was time to take the fight to the Grey Knights. 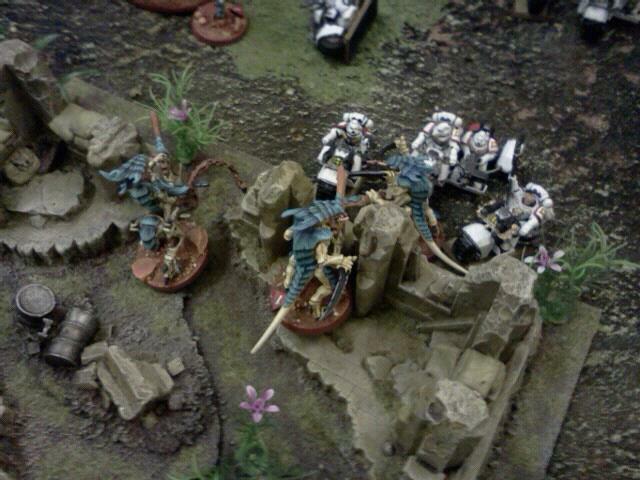 Another 8 Termagants we spawned. 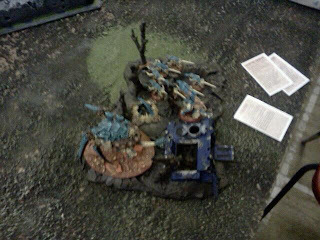 They gnawed their way 5" through the ruined building. 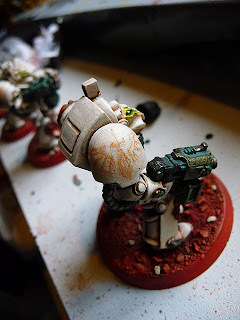 Emerging from holes and laid a withering hail of flesh eating living bullets into the Knights but only one of the tenacious grubs managed to bore through their ornately carved armour. With the Tervigon urging them on the Termagants swamped the Grey Knights. What ensued wasn't pretty, some erroneous stats recall on behalf of the Grey Knights Codex meant we did much more damage than we should have done. 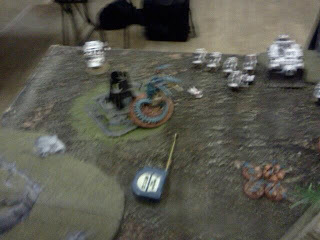 I tried to convince their commander to check again but he was adamant they had a WS of 2! 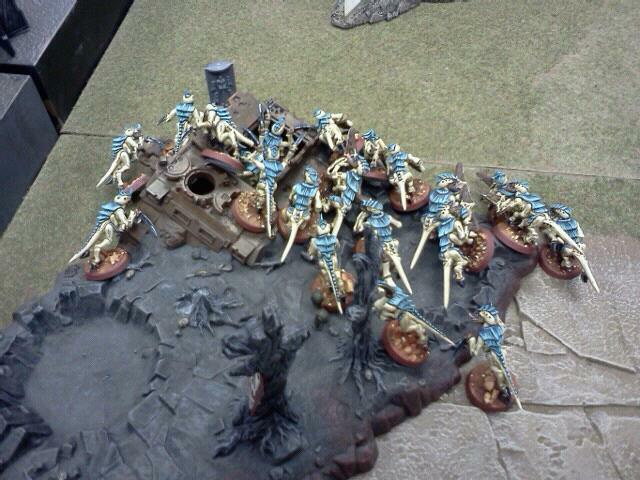 However he also said they had an initiative of 8 so by the time the termagants got a look in 10 had already perished. In the end one knight was poisoned and two further wounds were caused. When it was revealed their initiative was in fact only four and the Tervigon's adrenal glands gave the Termagants initiative four also the recently deaded gants attacks were added into the mix but failed to do anything. I think by this time all the kids were losing interest, hence the mistakes taking place. 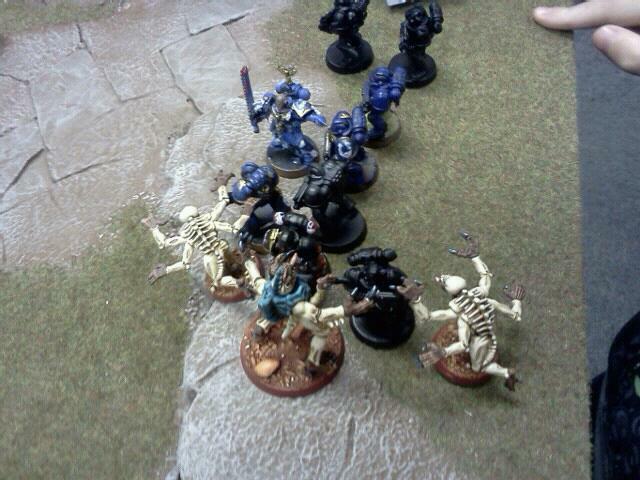 ... and as they broke and ran 1" the stealers dragged down a sixth marine as he tried to escape. In Conclusion: although the kids think it'll be fun to have a three way battle it does involve waiting for two people to have a turn before you get to have a go back. I think they were all getting a bit tired by the end. My nipper was starting to get bored, mistakes were happening and things may not have been going to plan. Fair play to them they behaved really well and it was a fun game. 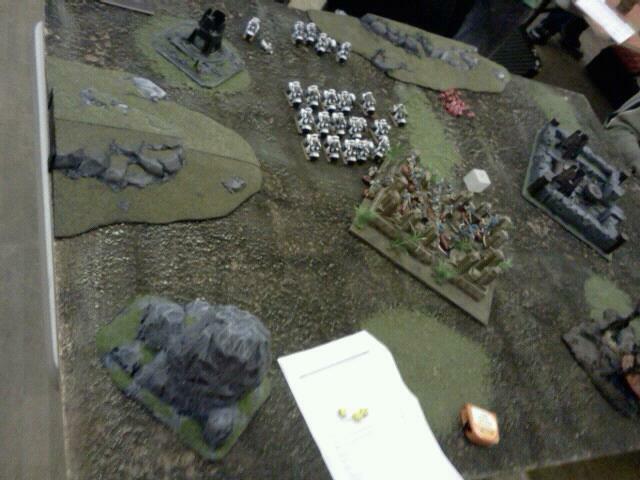 The three way didn't really materialise, ythe Grey Knights weren't really threatened. With hindsight the Hormagaunts should have just charged the unit in front of them. I don't think they were anything more than power armored knights so they could have done some real damage with their 30 scything talon attacks. The 3 remaining Termagants could have secured that objective, which won us the game. We could have done much more damage, but we stuck to the objectives which was the ultimate prize afterall even if the Hormies were just wittled down and never got to assault which was my reason for running them! 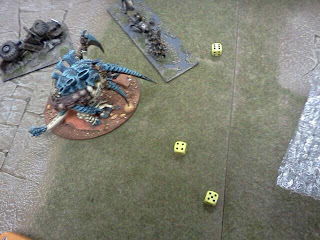 Overall I think 'nids excel at these small battles. Its only when we go bigger we struggle as we need a slightly different force to capitalize on the extra points. The Stealers were back on form but I really saw some advantage for adding scything talons, re-roll 1's would have come in handy. Hitting 2 out of 3 times with a further chance to increase that to 5 out of 6 may be worth the extra 2 points each, it certainly benefits the Broodlord. Perhaps in a 750 or 1000pt force I may take them. Anyway, next weekend is the 40k anniversary at the store so we may be back again and tonight is gaming night so it's all much fun!